Vision is incredibly important to learning. Frequently, children with undetected vision problem can be labeled as having behavioral or learning disabilities simply because they are unable to see or focus on their work. The fix? A pair of eyeglasses. Annual statistics have shown that 75 per cent of children between the ages of five and nine have not had their eyes examined by a Doctor of Optometry and a staggering 93 per cent of all children under the age of five have never had their eyes tested; despite the fact that annual eye examinations are covered by Alberta Healthcare for children 18 years of age and under. It is estimated that nearly half of all high school students will also leave high school without ever having had an eye exam. Many parents are shocked to discover their child has a vision problem. Unfortunately, problems are not always obvious to a parent or child. Children have no form of comparison and assume others see the world as they do. An annual eye exam provides a tremendous amount of ‘peace of mind’ to parents and ensures the child has the vision to succeed at school. 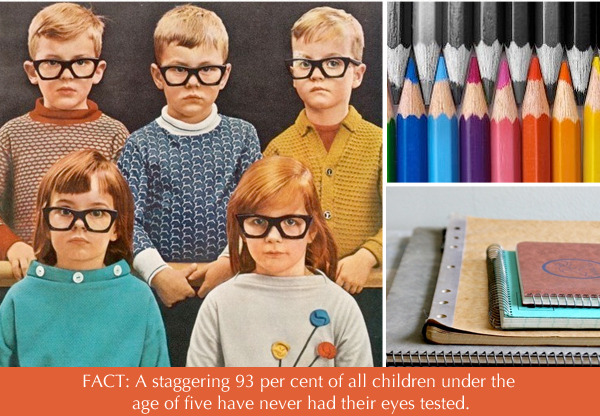 Book your child in for a comprehensive eye exam and vision test at either Kingsway Optometry or eye-bar today!